Why? The reason is obvious. We need to raise a budget, and people in the churches tend to empathize more with the needs of abused and neglected children than with national pastors and their need for more extensive, higher quality ministerial training. This tough choice is made even more difficult by the ever increasing time restraints placed upon us in our presentations. Sometimes we are given only three minutes. How should we use them? What should we talk about? I am very blessed to have an important role in our outreach to the children of Santiago. I love the fact that my involvement with this ministry enriches my teaching ministry with an awareness of current issues, and enables me to make reference in the classroom to the ongoing challenges of our own hands-on ministry. When on furlough, I enjoy sharing testimonies about the kids we have helped, and appealing for help for upcoming projects. But I wish it was that simple to also encourage our supporters to give generously to national leadership training. Therefore, I want to use this month’s blog as a collection box of good ideas about how to share the challenges and opportunities of Christian Education in Latin America with an American church, which (to this writer anyway) at times seems to undervalue deeper Christian Education within its own body, much less show great concern for it somewhere else. Such a collection box might be of benefit to all of us. 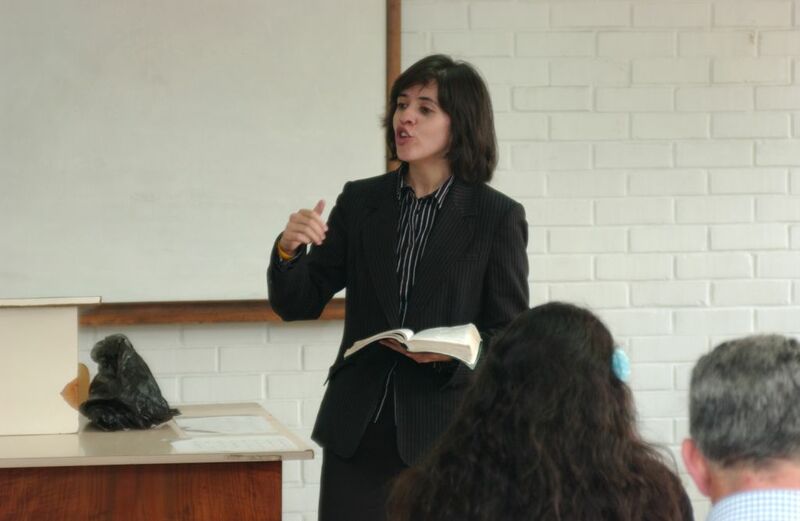 Since my computer is still turned on, I will get the ball rolling with a couple of ideas – some things from my personal experience that have proven to be pretty effective means of communicating the need and importance of quality Christian Education in Latin America. Please be thinking of some other ideas you might contribute to the discussion. 1, Be a story teller. I am convinced people would rather hear a story about one person and his or her experience than a statistical analysis of a large demographic of persons. People can easily relate to an individual, with his weaknesses, challenges, failures and triumphs. Everyone loves an interesting story. When serving in an ISUM seminar, I keep a notebook handy because from time to time I hear the most remarkable stories, such as a pastor who travelled three days and nights by bus to attend our seminar or of another who sold his car to have the money to come. People relate to people. If we can get our audience to put a face and a name on the whole subject of Christian Education, we are on the way to gaining their partnership in ministry. Just speaking about Christian Education ministries becomes an educational process in itself. We need to educate our own supporters about what is happening in our region of the world. For example, our unique regional distinctive of having a common language, shared by nineteen nations, and the wide range of possibilities that affords us, like no other region in the world, is something most people have never considered. But, when they hear about it, and understand it, they usually say, “Wow! That’s pretty cool; I had never thought about that before.” And bingo, there comes an opportunity to show just how essential our ministries are. So, how about it? What are some ways you have communicated effectively to your support base about the importance of your service in Christian Education? You don’t even have to make a confession. PREVIOUS POST Previous post: You’re Kidding, Lord! Short, sweet, to the point, effective and with an open heart. Memorable and practical. Great job with this article. If people will listen to you, we will get quite a few more bucks in for Christian Education. Love you much, my friend and brother! We feel your pain! We just finished a time of itineration. And in the last few months we’ve received a rash of church “missionary surveys.” Many of these speak to direct evangelism and outreach ministry among unreached people groups. Although it seems like we’re going against the current in ministerial training, as we had opportunity we always emphasized the “strategic” nature of multiplying outreach by training and enabling “front line” (evangelism) ministers. May God give you great success in communicating the importance of training and discipleship. Thanks for the feedback. I know what you mean, Rod, about those churches with the “surveys.” Some time ago I spoke with a pastor who is now focusing his missions program exclusively on ministries to the Muslim world. I pointed out to him the number of Latin Americans we train who are entering into strategic missionary service in the Muslim world, and the social, ethnic and historic advantages they have over white, blonde, blue-eyed American missionaries. This is just one more aspect of the importance of Christian Education in Latin America today. SO true… people don’t consider the impact of training pastors and leaders as important as other aspects, but we have a great representative in you! Thanks for the good tips. Un abrazo grande for both of you! Hey guys, case in point. Gustavo and Angélica, graduated from Coffee Region Bible School. Pastored for four years. After graduating Gustavo taught several years at our campus. Now they have been missionaries for two years in Bangladesh. Gustavo noticed that pastors outside the capital city of Dhaka were not getting any ministerial training. He noticed a lack of proper theology in their preaching, teaching and ministry. Yes Global University is doing awesome things, but their courses are in English and each course is 50 dollars, a month’s wage for most pastors in “provincia”. Gustavo has drafted a program for theological training by extension in bengali for these pastors, simple and inexpensive. The National Supt. loved the idea and told Gustavo to develop the program. Gustavo mentioned he had no funds. This week the Supt. called Gustavo and said that a church in Malaysia will be funding the program. So this theological extension program will start up in January 2011. You never know what God is going to do through those we teach and train in our classrooms!!! Thanks for the excellent advice on making something very strategic and long-term (Christian Education and Ministerial Training) both exciting and relevant to our North American audience. I start itineration next year and will be gathering stories about the Facultad ministry in Latin America.